Gasoline prices are up 29 percent from a year ago, so finding ways to stretch your personal petro dollars could be a welcome holiday treat as we head toward Thanksgiving, traditionally a big driving week. Putting fewer tigers in your tank will also reduce foreign oil dependence and greenhouse gas emissions, so that's, well, gravy. With the help of two experts - John Henry, a driver-training veteran who works with gas-saving groups EcoDriveSmart and FuelClinic, and Michael Scott, who created the fuel-saver site Moblu - I've put together nine lesser-known mpg-boosting (or "hypermiling") tips. 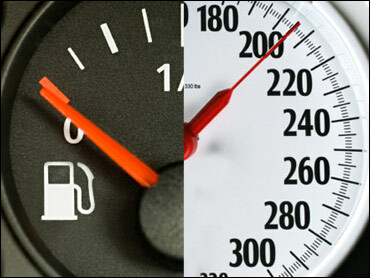 Of course, you know the familiar hypermiling advice: Avoid jackrabbit starts and sudden stops, drive slower (since every 5 mph over 60 is like paying an extra 20 cents a gallon for gas) and keep your tires inflated (the EPA says doing so can reduce fuel use by 3.3 percent). And MoneyWatch has steered you away from some other common myths about gas mileage. You can also skip those nutty liquid additives and air-hose attachments claiming to slash gas costs: After Consumer Reports tested the Fuel Genie, Platinum Gas Saver and Tornado Gas Saver last year, it concluded, "Don't waste your money. They don't work." Many people mistakenly believe it's harmful to your engine to simply start up and drive away, particularly in winter. But modern engines don't need much of a warm-up. Auto authority J.D. Power and Associates says even on the coldest mornings, 30 seconds is all the warm-up you need. Your best bet is to start the car and gently drive off. Not only does tailgating lead to the fuel-wasting cycle of applying brakes and hitting the gas to catch up, it can lead to sudden and unexpected road hazards. The Federal Trade Commission says that anticipating traffic conditions and avoiding tailgating can save 5 to 10 percent on your fuel bills. Scott confesses that controlling his lead foot was the hardest habit for him to break. Those toolboxes and old golf clubs cluttering your cargo space can cost you. According to EcoDriving USA, 100 pounds of extra weight translates to a 2 percent reduction in fuel economy. Scott says when he emptied the clubs and other nonessential stuff from his 1999 VW Passat, he saw an immediate improvement in his mileage. Professional drivers on the clock would never be without their electronic, windshield-mounted transponders, because E-Z Passes (and similar autopayment devices, like California's FasTrak and Florida's SunPass) let them zip through toll lanes, saving time and gas. A New Jersey Turnpike Authority study found that E-Z Pass reduced fuel consumption by 1.2 million gallons in its first year. An unscientific survey I conducted for the New York Times in 2003 found that most people don't have a clue what this light means. Often, the light is saying that the car's emissions system is malfunctioning. If your oxygen sensor has failed, replacing it could improve fuel economy by as much as 40 percent and end your car's status as a gross polluter. So take the Check Engine light seriously, even if your car appears to be running fine. A roof rack interferes with your car's aerodynamics and can cost you 5 percent in fuel economy, according to Scott. Bret Sarnquist, a blogger for the carbon-offset company Terrapass, upped his gas mileage more than 10 percent (going from 24 mpg to 27) by removing his Audi's roof rack, along with its two bicycles and box. The useful EcoModder site offers a whole page of modifications to make your car more aerodynamic. The problem is gasoline evaporation. A loose or missing cap (which can also cause starting problems) can result in up to 30 gallons of evaporation annually. And that's gas you already paid for. Hybrids such as the Toyota Prius have in-car fuel-use gauges that let drivers see their consumption drop as their behavior evolves, and this has turned ordinary folks into hypermilers. But you don't need a Prius; you can buy an aftermarket product, such as ScanGauge II ($170) or PLX Device's Kiwi MPG ($90), to track mileage for virtually any car. A $2.99 iPhone application called MyMPG can display and track mpg for up to four vehicles, beeping when you're wasting gas with bad driving. To test out one of these gizmos, I hooked a Fuel Efficiency Adviser ($160) onto my 2007 Honda Fit (already economical at 31 mpg combined). It calculates mpg, gallons used per hour and the cost of a driving trip. The manufacturer says the device can save 33 percent in fuel costs, which sounded a bit far-fetched. Messing with the car's electronics seemed scary, but turned out to be no big deal - just one plug, then attaching the device with Velcro. I was immediately able to tell the advantage of a light foot, briefly recording a stunning 99 mpg when I was driving carefully. Don't confuse this type of training with a standard driving school. Many driving schools are headed by former race drivers, so getting you to slow down may not be high on their priority list. Workshops such as the upcoming eight-hour program from EcoDriveSmart teach you fuel-saving habits that also help you drive more safely. EcoDriveSmart's courses use an in-car video and an "eco pod" that records data on braking times and acceleration. "The student and instructor go out on a driving route, then come back and look at the video and analyze the data," says Henry. Then they go back out for several cycles until the student morphs into an eco-driver. The courses cost $355 (including the eco-pod you keep to track your progress) and will be offered initially in California, Florida and Texas starting in January. • Why Do Oil Prices Swing So Wildly? • Video: Tesla Test-Drive: Time to Try an American Car?